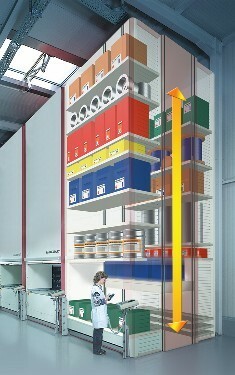 The Lean-Lift from Hanel is both storage efficiency and goods protection in one: at the center of the 'cabinet' is a computerized lift - called the extractor. In front and behind it are the storage shelves. This is where the articles are stored in containers. The storage locations are accessed through electronic control by the extractor. It stores or retrieves the container requested. The system is operated comfortably at the optimum ergonomic height at the retrieval zone. With the Hanel Lean Lift, we offer a high quality, high-tech warehouse organization system with readily available materials which reduces work time, warehouse space and cost which provides a problem free work environment. The Lean-Lift from Hanel utilizes the available ceiling height - similar to a high bay/miniload system. In contrast to a high bay/miniload system, however, the Lean-Lift stores the parts on a height optimized basis avoiding wasted space. This means maximum storage capacity on a minimal footprint. The fully automated Lean-Lift from Hanel brings the required articles to the retrieval zone in seconds. The state of the art microprocessor control systems from Hanel can communicate with your host computer on a real time basis installation or be used as a standalone warehouse management system. An overview of the inventory status is available at all times, shortages of parts are eliminated and the inventory can be reduced. Use of the Lean-Lift from Hanel ensures a constant overview of inventory status at all times. Retrieval points can be installed on more than one floor, depending on the height of the Hanel Lean Lift. Several users can operate the Lean Lift at the same time from different positions and levels. The wide range of accessories, such as tool inserts, small parts trays, cutting tool holders and dividers contribute to making the Lean Lift from Hanel into a complete logistics systems that cuts costs, makes optimum use of space, eases workload and mimizes allocation times. The variable control keyboard of the Hanel Lean Lift is positioned at the side of the access opening for ergonomic convenience. MP 100 D data can be viewed by browser - ensuring constant transparency in the storeroom.